Time has come to visit our beloved planet Earth once again. This year will be a busy one: Kozzmozz celebrates its 20th anniversary, with several astronomical gigs! This first edition of 2015 kickstarts 20 years of techno celebration! Space is a great place to get lost, to enjoy endlessly with the right soundtracks. Therefore, we would like to invite you on our interplanetary mission, exploring new and innovating sounds. On this trip we visit asteroids, spheres, dwarf planets and radio galaxies, looking for the latest developments in waveform transmission. That is a crucial matter in sound production. It’s of the utmost importance to keep an open mind to new sounds, artists and atmospheres. Break free from conservative habits. Don’t stop questioning or assaulting the system. For this first intergalactic edition of 2015 all our international guests in the main room will bring us a live set. This is something unprecedented in our 20 years of K-history! Our first big astronaut is a Kozzmozz favorite who’s joined us on numerous space-flights in the past. And that’s because his work has been outstanding all along his career which also spans over more than 20 years. This time Luke Slater will be presenting us a unique Planetary Assault Systems Live set, the alias that perfectly reflects the Kozzmozz philosophy. Under this guise he's produced some of the most lauded UK techno ever pressed to wax, beginning with the legendary Planetary Funk series in 1993. Since Slater revived Planetary Assault Systems after a five-year hiatus in 2006, releases—which include two albums on Ostgut Ton—have arrived sporadically. There was the P.A.S. remix of Marcel Dettman on MDR in August and now there’s a new EP on Mote-Evolver. Keep your ears out for ‘The Eyes Themselves’ which will be available at the end of February or come and check them out Live on Kozzmozz’ first anniversary celebration. Second headliner in Unit 5 is Johannes Heil who released his first track on Heiko Laux’ Kanzleramt at the age of 14. Raw and menacing beats combined with sweeping bass-lines and hypnotic sound-scapes define his sound. Hardly any other producer has blessed techno with so many productions. His early works have long since become part of the long term memory of Techno history, his musical passion remains as strong and vibrant as ever. His tracks are featured on important labels like Cocoon Recordings, Break New Soil, Klang Elektronic, as well as Len Faki’s Figure and Figure SPC labels on which he has been releasing regularly since 2013. In 1998 we welcomed him for the first time and every now and then he visited us ever since. On this edition he’ll bring us the energetic live set that only he can deliver! The third live-act is from another producer with many faces. In just a few years since his first release on Luke Slater's Mote-Evolver, Shifted successfully managed to develop his own distinctive voice within the constantly evolving techno scene. Soon after his 2011 debut, he set up his own imprint Avion, an outlet bringing focus to the more stripped back and textured side of British techno. On sub-label Mira he explores the esoteric and experimental side of techno, drone, noise and industrial. It will be the first time he will board our K-spaceship and he will bring us his brand new live set. We're pretty excited to hearing it! 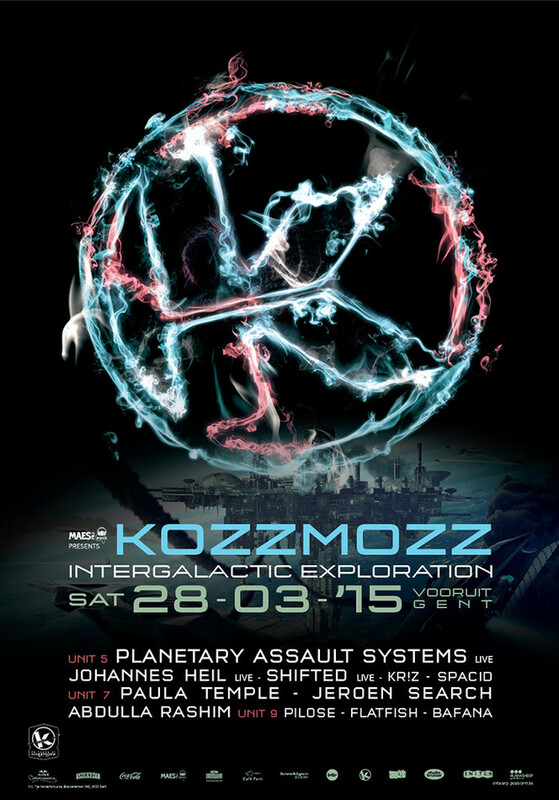 All this live action will be craftily jumpstarted and wind down by our resident space commanders Spacid and Kr!z. They have been maneuvering the Kozzmozz space-craft into the perfect directions over the years and they will do so again! Unit 7 will be the place where we will explore the newer sounds. Past and present may seem similar, nevertheless, the future is lurking around the corner....to boldly go where no man has gone before.. to have our extra terrestrial parties well known throughout the entire galaxy. We start off with Paula Temple who’s debut ‘Speck of the Future’ on Chris McCormack’s Materials label immediately got picked up by Jeff Mills for his Exhibitionist album. In 2013 she released the monumental ‘Colonized’ on R&S Records and ‘Human Drama’ remix for Planningtorock. 2014 brought ‘Deathvox’, the second awe-inspiring EP for R&S Records, alongside ‘Spheres’ a new release for Noise Manifesto, her own label and remixes for The Knife, Perera Elsewhere and Knox on Boys Noize Records. Such refreshing high-voltage output is rapidly placing Paula Temple at the forefront of new techno. And then there’s Jeroen Search, simultaneously one of techno’s most influential producers and well-kept public secrets. Consistently putting out quality music since the mid nineties on labels as Figure SPC, Axis/6277 and Coincidence as well as his own genre-shaping Search imprint, he still resides where he has been for many years now: the absolute cutting edge. Named by many as a source of inspiration, Jeroen Search embodies a clear and honest interpretation of techno. His tracks, while audibly open to new and exciting musical influences, always remain true to that typical, inimitable Search-sound. His work communicates itself with great ease due to its truly timeless nature. No less than 3 international stars in Unit 7 with the third one being Abdulla Rashim. Mystery is a fundamental part of this artist. Little is known of him and therefore his music speaks on his behalf. Since 2011 he’s praised all over the world for his work on labels such as Prologue, Semantica, Studio Barnhus and his own label, where it all began. Arab and African cultures are feeding his work and you can describe his sound as hypnotic percussion, intense undertones and psychedelic matter… He currently plays at the hottest Techno parties of Europe and has been high on our to-do list for a while now. He will deliver a dj-set, which we’re very much looking forward to. In Unit 9 we will travel through the deeper techno sounds. They may even hint towards house as we’ve invited sister concept Peep to our 20 Years festivities. Amazed by Pilose on the new year’s celebrations of Error 2014, we were quick to get him back on 20 Years of Kozzmozz. He’s one of the rising talents of the moment and known from the radio-show and several party concepts under the Ohm banner and originates from Kortrijk. He will be joined by Flatfish, the Antwerp based dj-duo who co-organize Lucid Festival and set up the Kazzino parties in café d’Anvers. Add to those Ghent’s hottest name of the moment Bafana known from concepts as Alpha and Kerk and you know that there will be no turning back! So let’s join forces on this first B-day edition, free our minds and explore the fantastic sounds and talented artists we have selected for you, our favourite earthlings!